Dialysis and pregnancy rarely go hand in hand, but Kurla resident Sharifa Sheikh has pulled off the impossible by giving birth to her third child a fortnight back. "I thought I was putting on weight and was shocked when the doctor told me that I was 24 weeks pregnant," said the 42-year-old Sharifa, who also has two daughters. What made it difficult for her to accept the situation was the fact that she had tried to get pregnant right after the birth of her second daughter who is now 12 years old, but in vain. "Moreover, we have a 16-year-old daughter," said her 44-year-old husband, Mohammed Arif Sheikh, a driver who has been out of job for the last three months and had to borrow heavily for his 'accidental baby'. The boy, born in Kohinoor Hospital, Kurla, on July 31, is in fact a medical marvel. 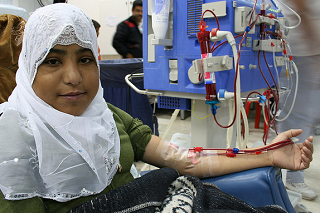 "It is extremely rare for a woman on dialysis to get pregnant,'' said nephrologist Aseem Thamba, who has been Sharifa's doctor since she was detected with kidney failure in 2005. Usually, women with kidney failure are past their reproductive age. Even if they are not, the fluctuations in hormones due to their disease is so immense that it's difficult to conceive.